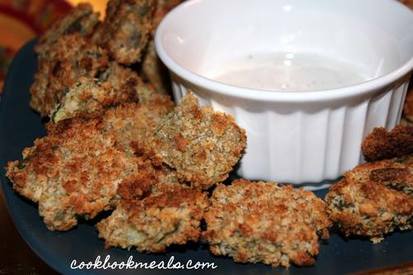 I have loved fried pickles ever since I first had them at the State Fair four years ago. I have always been a huge pickle fan (I mean, my favorite shot is even a pickle back! ), so the thought of coating them in a batter with breadcrumbs and frying them really excites me. A couple of weeks ago, I was having a few girlfriends over for dinner. So I decided to go ahead and try to recreate fried pickles. I do not have a deep fryer though, so I looked for an oven “fried” version. I ended up finding this recipe on Pinterest. And, boy, was it a hit! There was a slight hint of heat from the hot sauce and the cajun seasoning (I used my homemade recipe), and the panko made the pickles super crunchy. The pickles were gone in no time! Even my one friend who hates pickles tried them and liked them! I definitely will be making this recipe again! The best part of this recipe (besides the deliciousness) is that it was super easy to make. I actually had all of the ingredients in my house already. I used Claussen Dill Pickle Sandwich Thins (I couldn’t find the round slices), and just stacked them and cut them into thirds. They worked perfectly and were the perfect thickness. I was also able to coat the pickles ahead of time and place them on a baking sheet. I then set them aside until I was ready to put them in the oven. It was a great time saver.